Politics • Ron Bigelow says restoring trust in police, economic development are priorities. Scott Sommerdorf | Tribune file photo Former Utah Budget Director Ron Bigelow is running for West Valley City mayor. 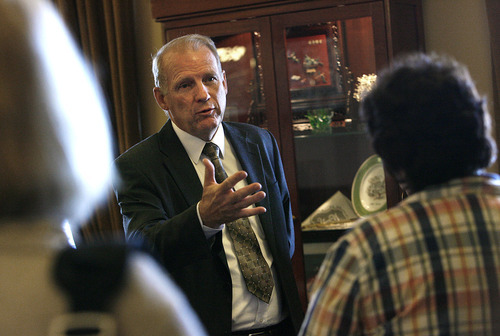 Former Utah state budget Director Ron Bigelow has filed to run for West Valley City mayor, saying that restoring confidence in the Police Department will be one of his priorities. Bigelow said he also will focus on financial matters and economic development in West Valley, which is the state&apos;s second-largest city, with a population of 133,000. His background gives him "unique expertise in budgeting," he said. He noted that West Valley City has a balanced budget and that City Manager Wayne Pyle runs the day-to-day operations but said, "I think long term there are things you can gradually put in place to make the city stronger." Bigelow, 64, represented West Valley City in the Utah House from 1995 until he gave up the seat in late 2010 to become state budget director. He also was a manager of finance with The Church of Jesus Christ of Latter-day Saints for 28 years. He retired as state budget director in January. Two other candidates, Don Christensen and Margaret Peterson, have also announced plans to run for mayor. Christensen, 68, a retired educator, is completing his first term as an at-large member of the West Valley City Council. Peterson, 66, served as an at-large City Council member for 17 years, choosing not to seek a sixth term in 2007. Both have also listed problems in the police force as an issue. The Police Department has been the center of controversy because of allegations of mishandled evidence in scores of narcotics cases and the fatal shooting last year of 21-year-old Danielle Willard during an alleged drug bust. Mayor Mike Winder announced last month that he will not run for a second term, citing the need for a full-time job so he can support his family.